Piketty’s second law states that in the long run, the ratio of the capital stock to national income converges toward the ratio of the savings rate to the growth rate. This second law is the equilibrium condition of a “zeroth law” (Yanis Varoufakis’ coinage), which says that the change in the capital stock from one period to the next is equal to the output from the previous period that is saved rather than consumed. (Minus depreciation of the existing capital, but Piketty somewhat idiosyncratically defines saving as net of depreciation, a choice that has been criticized.) This zeroth law is usually implicit, but it is critical to the question of whether we should treat capital as a physical stock. If a value is stable over time except for identifiable additions and subtractions, we can usefully treat it as a physical quantity, whether or not it “really” is one. If we assume that the evolution of the capital stock follows this zeroth law (i.e. that capital is cumulated savings) and also assume that savings and growth rates change slowly enough for the capital stock to fully adjust to their current values, then the capital output ratio will converge to the value given by Piketty’s second law. [^17] This apparatus – which is basically the growth theory of Harrod and Domar via Solow – is Piketty’s preferred tool for analyzing changes in the capital share over time. There are many ways to see this. Here are a couple of examples, using data from his online data appendixes. 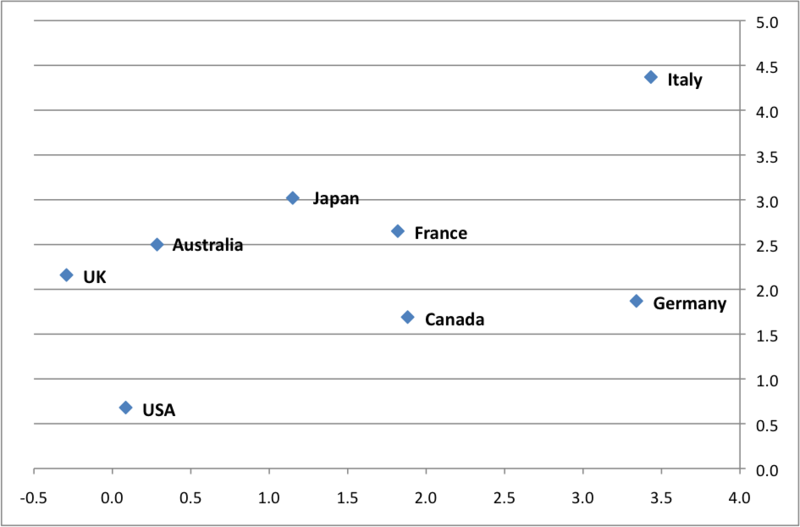 [^19] First, let’s look at the change in the wealth ratio beta in various countries since 1970. This rise in the value of capital relative to current output is one of the central phenomena Piketty wants to understand, and underlies his claims about the increasingly skewed distribution of personal income. The horizontal axis shows the change in the wealth ratio implied by observed savings and growth rates. This is the change in wealth ratios that can be explained by differential accumulation and growth. On the vertical axis is the actual change. [^17]: I’m emphasizing the “zeroth law” here, but it’s worth noting that the conventional practice of treating s and g as “slow” variables and beta as “fast” is also open to question. If you look at the historical data, national savings and growth rates are much more variable than the capital-output ratio, and they don’t appear to be stationary around any long-term average. So it seems a bit nonsensical to talk about the capital-output ratio as converging to a long-run equilibrium defined by a fixed s and g.
[^19]: Piketty’s presentation of his data online is superb, both in content and organization. Even if the book were otherwise worthless – which is very far from the case – these appendixes would be a huge contribution. [^20]: Another problem is that Piketty’s narrative suggests that r, the rate of return on capital, is constant or increasing, while his data unambiguously show a long-term decline. As a result, the rise in the wealth ratio has not been accompanied by a rise in the capital share, at least not everywhere. In the UK and France, there is a clear downward trajectory from a capital share of 40 percent in the mid-19th century to around 25 percent today. Remarkably clear and jargon free. Are you sure you are a real economist? Yeah, kudos for this. It’s the finger exactly on the sore spot. – But then “r” also is arbitrary and determined by – what exactly? Then “total wealth” depends both on the wage share and r, two arbitrary coefficients. We end up with two questions instead of one. PS. a nitpick: While it’s true that Italy is slow-growing, this is true mostly from 1990, so that from 1970 to 1990 Italy grew faster than the USA, while from 1990 to now Italy grew more slowly, but still if we look at the 1970-to-now time window I think Italy grew silghtly faster than the USA (in terms of hourly productivity). I just checked the contributors and you are not on the list, not that I haven’t been an admirer of yours. Is this a guest contribution or are you joining? I see it is a part of the Book event – wasn’t clear from the start. Great explanation, it made the difference between physical capital and monetary capital, and why this difference is so important for evaluating the historical evidence, crystal clear for a non-economist. Then you clearly see the implicit assumptions about what is independent and what is dependent. Maybe. But maybe there are other factors at work – for instance a larger proportion of savings beings in the form of statutory contributory pensions, and much stricter regulation of borrowing. Asset prices are driven to some extent by the amount of funds chasing the assets. Forgive a Layman’s question, but it strikes me as unlikely that wage growth – income derived from labor – can exceed g over the long run. Is that not the case? If not, how not? Is it really the case, I wonder, that Piketty was unaware of the lacunae in his narrative? No doubt his interpretation in C21 of the data he and Saenz have accumulated — at least as I understood it — skirted the question(s) raised here and elsewhere. In my reading, though, it seemed that he was setting a sort of trap for the masters of conventional wisdom. If my data are correct, he seemed to be saying, and the current trends are what that data imply they are, do we not have a problem? Moreover, if my solution to that problem is politically impossible, then what would a politically possible solution look like? Isn’t there a sort of neo-Marxian seduction implicit in this formulation? Hasn’t he in fact been anticipating J.W. Mason’s (and others’) criticism — or am I attributing more subtlety to his presentation than the evidence merits? Now you have confused me. Do you mean hourly productivity in manufacturing (which I understand) or some more general measure of productivity (which I’m not sure we can measure). Because it matters a lot, because the relative size of the manufacturing sector might be changing. What do you mean by long run? Of course any fraction that grows faster than the total will run into a limit at some stage (capital income as well). But for substantial periods of time, it is possible that a share increases. He doesn’t have to be a master manipulator, just a well-practiced veteran of the academic circuit, with long experience of what sells among the tribe known as the econ. As long that the wage share of total income is less than 100% wage growth can be fater than g, by eating into profits, no? At some point wage growth has to track g because wages cannot be more than 100% of income obviously, but what is the minimum, or the correct, profit share? Who knows really? How well does s/g do in explaining the long-term movements of K/Y? Piketty is fully aware of Mason’s challenge and presents historical data at different places in the book to meet it. So those Piketty’s pre-emptive arguments will have to be found and carefully engaged. Now without re-reading the chapter on the capital/income ratio in light of Mason’s important criticism, I remember that Piketty does grant that the UK does not fit in the last half century but tries to show how Japan does (in spite of the bubble and its puncturing) and that the difference between Europe and the US can be accounted over the long term by s/g and (somewhere) the long term evolution of K/Y in 19th c. France is reasonably accounted for by s/g. It’s not clear to me that if we measure K not by market value but by book value that the broad dynamics of K/Y in Germany is not well-explained by s/g. Instead of alpha=r(beta), we could have r=alpha/beta. That is the form you would need to show that r which drives investment depends on distributional conflict over capital’s share of income and changes in the capital intensity of production. This way we get the bargaining question in the numerator, but do not make the dynamics entirely entirely dependent bargaining power as Mason in his voluntarist theory is doing; the capital intensity of production also conditions the dynamics. I think Mason will recognize where the first law in this form comes from. Yes, as I remember, that was the gist of Yannis Varoufakis’s somewhat uncharitable interpretation — that Piketty was making sure his status as an economic intellect to be reckoned with would remain secure no matter what happened to his argument. Given how he comes across in the interviews, discussions etc., available on the Web, though, my impression is rather that he wanted to avoid seeing his argument marginalized before its implications were firmly embedded in the public discourse. Yes, this is what I meant. When I read Piketty, I recall thinking that the r > g problem seemed intuitively obvious, because I would expect wage growth to normally be less than g, and I’m reasonably sure it has been so for all of my working life. If so, then r > g will certainly increase inequality. What am I missing? Yes I understand that this is a rather non-relevant nitpick but, as I’m italian, from my point of view is important, or at least interesting. In theory wage growth “should” be equal to g if the wage share of income is stable. The problem is that most often economists treat the wage share as technologically determined, hence more or less fixed. Piketty shows that this is not the case. IMHO a lot of economic theory should be rewritten if the wage share is not fixed, for example the “correct” interest rate makes sense only in case of a corrct rate of profit, that implies a correct wage share. However, I’m not an economist, so I’ll leave this argument here. My guess is that statistic doesn’t look much different than what has happened to exchange rates over the same time range. As I said, I don’t place much value of economy wide “productivity” measures. Manufacturing figures which are closer to measuring like to like are more meaningful. I also think that such measures of “productivity” are very ambiguous, however in the specific case of Italy I don’t think that the xchange rate is the point (at best, as Italy joined the Euro after 1990, this can explain a loss in competitivity not a loss in nominal productivity). I think that the continuous austerity since the 90s is the relevant part. Hello – this is really terrific, thank you. never considers the possibility that the economy is bargaining situations all the way down, presumably because this would deprive him of a meaningful standard by which to measure productivity. Piketty basically has three, maybe four, data points. And one of them, the US where the increase in inequality has been driven by completely different factors, pretty much contradicts his story. That’s the thing, even if you buy the r-g thing as a theoretical insight (you shouldn’t), as an empirical regularity it’s also very weak. That’s pretty much my view. Masterful critique, Josh. I hope Piketty replies to it. A bit of a digression on bargaining power. Historically and geographically when the bargaining power of capital is compromised the result is unfree labor — serfdom, slavery, master-servant legislation, anti-combination acts, “right-to-work.” In other words, weak bargaining power translates into strong state-sanctioned coercion. The theory underlying this is Evsey Domar’s channeling V. Kliuchevesky (1970, “The causes of slavery or serfdom: a hypothesis.” J Econ Hist 30:18–32). Domar? Does the name ring a bell? Notsneaky – I was hoping/expecting you would agree. I noticed you made very similar points in the discussion to some earlier posts. It explains very little of it. For instance, based on s/g we would predict a decline in K/Y in the US since 1980. I feel like the capital gains story undermines the labor bargaining story a bit. Specifically, are the capital gains coming from increased expectations of future cash flows due to weak labor, or are they coming from a lower discount rate? And what is the appropriate discount rate to use? Monetary policy that is only indirectly related to wage bargaining becomes important. I would agree that Domar’s theory is incomplete in many respects. It’s only elaborated by Domar for a “simple agricultural economy” — which I would take to be more or less equivalent to the friction-less plane in physics (i.e., there is no such thing). I think it is suggestive though and has been fruitfully explored in specific empirical contexts, such as by Barbara Solow (no relation to Robert AFAIK) in relation to the early modern Mediterranean sugar industry. Is Piketty really saying that? I thought his global tax solution was one possible reform. And couldn’t one read the historical data as saying that for some combination of reasons, or for no reason, r is usually around 5 and growth is slow, except for the social democracies’ golden age? But then is Mason arguing, correctly, that there’s no basis to predict the future? Is Piketty really that pessimistic about the future or is he more open minded. One can be pessimistic about the trend but then follow that up by saying things aren’t set in stone. AFAIK, Barbara Solow was the wife of Robert Solow, and will prove to have made a more important contribution to social scientific knowledge than her husband. I’d like to simply add my praise for this particular article. It was very well written and was easy for an educated lay-person to follow. I’m not sure I’m qualified to poke holes or assert alternatives, but I guess my reading of it suggests that these explanations fit the data a whole lot better than Picketty’s conclusions do and as such, seem to point to materially different policy prescriptions than the ones which Picketty’s supporters would want to promote. As has been observed on other threads within this series, it seems like the singular benefit of Picketty’s work is to provide a fairly obtuse set of data and conclusions which can be subverted to favored policies, regardless of whether the work supports those polcies or not. This work provides a better read of the data – time will tell if the conclusions gain their own appropriate level of bargaining power within the discourse. @29 First, this is a single example, which then raises the question of its probative value in relation to the examples adduced by Piketty (Japan from 1970-2010 in spite of a bubble, comparison of Europe and the US over the long term in terms of s/g, the rise of K/Y in 19th century France being well accounted for by s/g,). Piketty (p. 173) himself carefully argues that much of the explanation for the rising wealth ratio in the last forty years is due not to s/g working its way out but to the privatization and transfer of public wealth into private hands in the 1970s and 80s (esp crucial for the UK, see also p. 187 for Eastern Europe) and a long term catch up phenomenon affecting real estate and stock prices. Now I cannot find immediately the proportion of the K/Y increase in, say, the last forty years that Piketty thinks these two factors account for, but it is substantial, so what Mason is saying is roughly what he himself says, more or less, with his own regressions, to boot! Again I think a careful reading of the capital/income chapter will reveal Piketty more than willing to grapple with the difficulties that his beta equation runs into. At any rate, it will be interesting to see how Piketty responds to the Mason/Galbraith/Varoufakis criticism. Thanks for that. I just checked. You are right. Barbara Lewis Solow, known to her friends as Bobby, died on Feb. 17 in Lexington. She was 90. She was a longtime resident of Concord and Boston, and spent more than 50 consecutive summers in Chilmark. Bobby was a native of Trenton, N.J., a fact of which she was immoderately proud. She was born on Nov. 8, 1923 to Abraham and Katherine (Lakoff) Lewis. Her mother died while she was young, and her upbringing was largely in the hands of her father’s housekeeper, Barbara Bauer, who was like a second mother to Bobby and her sister, Janet. She graduated from Trenton High School and Radcliffe College (1945) where in 1942 she met and became engaged to the love of her life, a Harvard student named Robert Solow. They corresponded daily while he served in North Africa and Italy in World War II, and upon his return were married and began their doctoral studies in economics at Harvard. After a 13-year interruption to raise three children, Bobby returned to Harvard to complete her dissertation in economic history under Alexander Gerschenkron. She was a specialist in Irish economic history and in the economic history of plantation slavery in the Caribbean islands, and was on the economics faculty of Brandeis University and Boston University and finally a research associate at the W.E.B. Du Bois Institute at Harvard. In retirement she studied the novels of Anthony Trollope, and the light they shed on 19th century Irish economic life. She wrote and edited several books and scholarly articles in her specialties, and a volume of her essays on Caribbean slavery will be published in May. Bobby is survived by her husband, Robert M. Solow; her children John Lewis Solow and his wife Catherine of Iowa City, Andrew Robert Solow and his wife Margaret McCormick of Woods Hole, and Katherine Solow and her husband Daniel Duling of Los Angeles; and grandchildren Rebecca, Benjamin, Kathryn, Daniel, Thomas, Lewis, Nicholas and Anna. “I would like to thank my sons, Andrew R. and John L. Solow, for assistance in producing the mathematical results, and my husband, Robert M. Solow, for assistance in producing the sons”. To add, Barbara Solow’s stuff on slavery really is excellent and pretty comprehensive. I thought she was a historian though not an economist. My buddy Suresh Naidu — conversations with whom were the origin of this post — made the same Domar connection in his Jacobin piece on Piketty. I’m sorry to say I hadn’t seen your blog before. (There’s a lot to read, on the internet.) But I definitely will be looking at it in the future. Late to the party, so let me just join in thanking Josh for an extremely enlightening post. It’s true that slow-growing, high-saving Italy has the biggest increase in the wealth-income ratio, just as the capital-as-quantity approach would predict, and that fast-growing, low-saving United States has the smallest. But that’s it. German savings have been nearly as high as Italian,and German income growth nearly as slow, yet the growth of the wealth ratio there is close to the bottom. It’s true that slow-growing, high-saving Italy has the biggest increase in the wealth-GDP ratio, just as the capital-as-quantity approach would predict, and that fast-growing, low-saving United States has the smallest. But that’s it. German savings have been nearly as high as Italian,and German national income growth nearly as slow, yet the growth of the wealth ratio there is close to the bottom. A layperson reading quickly and late at night sees the phrase “wealth-income ratio” and may not immediately grasp what the phrase means here, which is why I suggest these minor changes — should you ever decide to expand this into a bigger paper or something. “Instead of alpha=r(beta), we could have r=alpha/beta. An accurate and crystal clear demystification of the r>g business. Thanks, and congrats. (And also, btw, exactly what I’ve been saying). Don’t let it go to your head, JW. This is very clear. It chimes with my own, much less well-expressed, thoughts. Perhaps one could link the confusion of capital (the physical means of production) with wealth (the value of claims on income) with Ann Cudd’s post on the Normative Force of Wealth Inequality. It can’t quite be bargaining power all the way down, because that would lack any legitimating justification. Re-casting wealth as capital (and capital as the result of frugality) offers that justification. OT but on the normative issue I’m coming round to the view that there doesn’t need to be any ‘legitimating justification,’ all that’s needed is a way of fobbing off particular people with particular criticisms at particular times. If such justifications collapse under sustained scrutiny, perhaps that’s not important, or only in the Keysean long-run. “2. If you believe in, or even use, marginal productivity theory, you are conceding that capitalists deserve their income. “Neither of these things are true. Nothing about marginal productivity theory depends on the exact truth of a simple aggregate production function with capital defined by a single number. And saying that capital gets its marginal product in no way says that the people who own that capital deserve what they get. Snarl over, Krugman then put his mask of supreme reasonableness back on. “So by all means let’s continue to debate how we do economics. But inequality really isn’t a wedge issue in that discussion. You can be perfectly conventional in your economics — or, my own attitude and what I think is Piketty’s, willing to use conventional models when they’re convenient and seem useful without treating them as irrefutable truth — while still taking inequality very seriously. That remarkable defense by Krugman for muddle-headed thinking as long as it is conventional, neoclassical and “convenient” struck me as revealing of his stubborn adherence to the conventions that make mainstream economics a tool of conservative ideological legitimation and obscurancy, but maybe is also a measure of just how heavy a lift Piketty faced, to use Brad Delong’s piquant phrasing. If you can only engage Krugman on these extreme concessionary terms, maybe Piketty’s discretion concerning which battles to fight is sensible. Krugman would seem to be one of the easy ones, after all; if you can’t get Krugman, who could you get? Better to be regarded a fool, than ignored entirely. The production function maybe seems an esoteric’s gateway into that labyrinth of algebra and calculus, where economists take the unwary for a magical mystery tour of mystification and helpless confusion. As Henry says in one of the other Posts, “Standard economic arguments start from an implicit set of assumptions about the absence of power relations.” Well, the production function embodies those politics-stripping assumptions. Yes, I suppose my semi-fictional narrative of a Piketty who employs the skillful means of a Zen Master to subvert the status quo is more than a little lame. My only defense is that subversion by design makes a more dramatic story than subversion by accident. On the other hand, the latter might serve us well enough in the end, depending on who and how many can be persuaded that something must actually be done. I probably shouldn’t bet on it, though. If Krugman’s rush to hide the silverware is any indication, what we’re more likely to wind up with is yet another one of those sickly just-so stories, tainted with the same kind of wishful thinking that made rabid Obama supporters out of people who damned well ought to have known better. If so, what remains for an old leftie except to tuck his Wobbly card back in his shirt pocket and head on down to the pub. @51 See http://www.potemkinreview.com/pikettyinterview.html, beginning with “I do not believe in the basic neo-classical model.” Krugman does not have Piketty right on this question. That’s a very nice interview. I had meant to link to it in the post. I do not believe in the basic neoclassical model. But I think it is a language that is important to use in order to respond to those who believe that if the world worked that way everything would be fine. And one of the messages of my book is, first, it does not work that way, and second, even if it did, things would still be almost as bad. Which is consistent with William Timberman’s story. It’s also incidentally very much like the relationship of the original Capital to Ricardo. I think bargaining power is very important for the determination of the relative shares of capital and labor in national income. It is perfectly clear to me that the decline of labor unions, globalization, and the possibility of international investors to put different countries in competition with one another … have contributed to the rise in the capital share…. I certainly agree that the (s / g) logic is never sufficient to explain the entire evolution of β. I think the change in relative asset prices for real estate, the stock market, and other assets can sometimes be a dominant factor …, even [for] 100 or 200 years. … in the long run the relative price of housing–in particular in major cities, where most economic activity is concentrated–can rise permanently … And I make it clear from the beginning when I refer to Ricardo, that it would be overly optimistic to rule this out for convenience. So of course he’s aware of the kind of argument made by Varoufakis, Galbraith, Knibbe, and me in this post. I probably should have made it clearer, my goal here was not to take an “anti Piketty” position, but to show how little his (IMO very substantial) contributions depend on the whole apparatus of s, r and g. Now, to what to extent he adopted that apparatus as a kind of immanent critique of orthodoxy, and to what extent because he thinks it’s genuinely useful in organizing positive claims about the world, I couldn’t say. I think you and Sneaky Not are not right about how much Piketty’s argument depends on that whole apparatus. When he tries to show that the movement of α can be explained in terms of what he claims to be a reasonable estimate of the marginal rate of substitution, he is working within the neo-classical framework. But I don’t think is whole apparatus is such an immanent critique. I want to see whether we can agree on what it is. and an unequal rentier society will emerge out of the petit-rentier one we have. The emergence of an actual rentier society depends on the difference between r-g rising and stabilizing at a new level. Of course if r fell in proportion with g, then alpha would at the least not increase. r must be greater than g, and the whole dystopian dynamic depends on the difference between r and g stabilizing at a new higher level. Eventually the system will reach a steady state as a rentier society if there is not revolt along the way (Piketty reminds his readers that rentier society on the even of the Great War engendered retrograde nationalism as a way to unify a divided nation and violent frustration–see also Bukharin’s critique of rentier society; Keynes would later hope for the euthanasia of the rentier). Piketty expects backlash. Perhaps Piketty thinks he has fired an even more dangerous missile at the head of the bourgeoisie than Marx claimed he had; after all, Piketty has better statistical technology. The problem with Piketty’s theory is not his insistence that the widening of the difference between r and g plays a crucial role in his theory–I think this discussion has been very misguided; it is his supposition that that s and r will not decline in the course of accumulation. But Piketty is aware of the problems here–see here his piece in JEL. Piketty could have more easily freed himself of the supposition of declining marginal returns on capital had he built on the basis of the Cambridge Capital theory, but he is probably right that s will not decline by much as wealth accumulates as consumption will represent, if anything, a smaller share of an enormous capital income. It’s also incidentally very much like the relationship of the original Capital to Ricardo. A point that does not appear to have been fully grasped by Marx’s recent biographer, the historian J. Sperber: see Karl Marx: A Nineteenth-Century Life (2013), ch. 11, “The Economist,” esp. p.462. Where in Capital I chs 4-6 and 21-23, Marx argues that property laws that were meant to said to secure the fruits of one’s own labor become the framework to own in objective form the the appropriated labor of others, he is engaging in an immanent critique not of Ricardo but Locke. I would love to talk about Piketty’s opening chapter on Ricardo, Marx and Kuznets. Yes, Rakesh, I understand the logic. My point is that this kind of story does not, in fact, explain the variation in the wealth-to-GDP ratio or capital share historically. This assumes that r reflects the marginal product of physical capital. Otherwise robots have nothing to do with it. In the example I gave from Ian Steedman useful robotization either maintains or increases the available surplus while putting capital in a good position to appropriate at least the same share of it. r is not being technically set by the marginal physical product of capital. There are no marginal physical products in a Sraffian framework, the same framework Samuelson used to try to rid the world once and for all of the labor theory of value. Give the data over the last forty years that you tested, Piketty had already agreed with you that s/g was not always the major factor in the increase and in the variance in wealth/income ratios. But once we account for privatization and the long-over due reduction in the risk premium, the effect of s/g shines through as an explanation for Europe’s higher ratio than the US’s, the rising wealth-income ratio in Japan even after the bubble was punctured, and in the rise of the wealth/income ratio in France in the 19th century. He does at least have some data going his way! So if savings are not used for real capital accumulation but rather for speculation in real estate and stock markets, then in real terms the K/Y would not be rising; but would such a bout of speculation also raise the capital share of income? It could due to the wealth and credit effects generated by asset bubbles that profits and the capital share of income rises as well (Akerlof and Shiller consider such a dynamic in their Animal Spirits). So here we would have a fun house mirror of Piketty. Yes due to asset inflation it appears that K/Y is rising with s/g and that all this is resulting in a rising capital share. It would seem that Piketty’s laws are holding. Beta is rising due to a higher s/g; and alpha rises as a result of the increase in beta. But in fact the rise in K is a rise in nominal values only; and one of the reasons g is low is in fact due to weak real capital accumulation. If this is the story J.W. Mason is telling, I would not rule it out. It’s an old Marxist story of course–see Henryk Grossman, 1929. What channels savings into a frenzied bidding up of the prices of assets in real estate and stock markets rather than into real investment is of course a drop in the profitability at the margin of new capital accumulation. I wonder about this in the case of land. In the sense of land as a productive capital asset, it might indeed make sense to view it as a “physical stock” that increases over time. Take the semi-arid land of California’s Central Valley. It used to be almost worthless as farmland. But with irrigation systems, tractors, fertilizer, rail lines and roads and trucks to ship out the produce, it has become some of the most productive farmland in the world. We can straightforwardly measure that increase in capital value as a “physical stock” quantified in bushels per acre. We could equivalently think of the increased fertility as the production of new land–the creation of many new Central Valleys to grow food on. So how do we account that increase in bushels? Doesn’t it make sense to think of it as an increase in landed capital as a physical stock? Or should we think of it as the return on capital invested in irrigation and transport? Should we chalk it up to the factor productivity of fertilizer? Or impute it all to increased labor productivity of the farmer? Let me say that I have appreciated your impressive command of the Piketty oeuvre, including interviews and commentary supplementing the text of the Big Book, and the perspective and sense of proportion and context that it has allowed you to share. Rakesh Bhandari @ 62: So if savings are not used for real capital accumulation but rather for speculation in real estate and stock markets, then in real terms the K/Y would not be rising . . . a rise in nominal values only . . . What channels savings into a frenzied bidding up of the prices of assets in real estate and stock markets rather than into real investment is of course a drop in the profitability at the margin of new capital accumulation. The tyranny of the neoclassical model derives from the potent hold deep metaphors that contrast the “real” with the supposed maya of money, as if money were this veil that shrouds “what is really going on”. There’s a not very subtle theme in the neoclassical model — which the Krugmans fiercely deny but never eschew — of virtue magically driving the operation of the system and it weaves together with this distinction between the real and the nominal. What’s hard to grasp is that the economy is not a morality play, even though economics is a moral science. The institutional economy is the only economy that exists and the institutional economy provides a kind of virtual reality where money is how we move the game pieces and keep score. There’s no social behavior outside that virtual reality created by institutions, even if there are real consequences. The ex ante organization of production that we refer to as real capital investment is mobilized by money in flows of funds and the score-keeping of credit. And, if there is any income to be drawn out of ex post output, it is because the rules of the game have been successfully manipulated to permit earning an economic rent. The so-called stock of capital, however virtuous its enhancement of productivity, draws no natural income independent of the political rules and business models that find an economic rent in exclusion and coercion. That economic rents represent an opposition of private power to social good just points to how inescapably problematic is the loosely coupled economic activity of an economy that features so much hierarchy, uncertainty and displacement of risk. The distribution of income isn’t well-characterized by rates of flow alone, because the distribution of income in its full regalia as motive power is the distribution of risk. That bigger piles of money earn higher rates of returns than smaller piles of money “savings” is a clear tip-off that risk and insurance, not accumulation of a productive stock per se, is key. It occurred to me the other day that talking about money/finance and “the real economy” was akin to talking about the nervous/endocrine systems and “the real body”. This supports a Piketty like mechanical process of inequality over a political one like Mason is proposing. 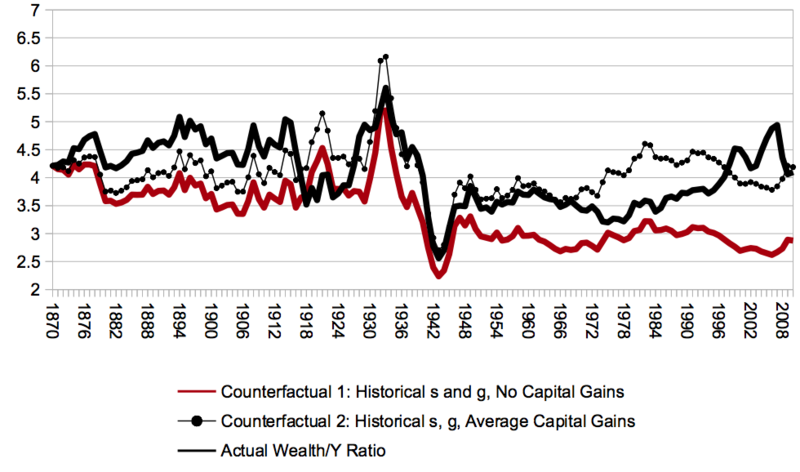 Also it should that focusing on aggregate wealth is misleading if the returns on capital are different along the wealth scale, in the US the bottom quarter probably is probably close to zero or negative net financial income. If it wasn’t otherwise clear, I am with Mason: it is about bargaining power all the way down. The bargains we strike are contingent ones, in which the distribution of risk shapes behavior, and is meant to shape behavior. The archetypal employment contract: “I’ll pay you a fixed wage to do what I tell you to do, and if you don’t do it, you’re fired.” features such a contingency. Its effectiveness depends on how costly to the employee it is to be fired and how productive, within the employer’s production organization, it is to be obeyed. The employer has the legal and political power to exclude the employee from access to that productive organization of resources — the means of production, as it were — and probably also to make a take-it-or-leave-it offer of employment as well as to fire the employee “at will” or pursuant to some process under the employer’s sole control (e.g. binding arbitration). This is the basic outline of the bargaining context, and though its fairness or unfairness may be the thing to first strike a casual reader, the economic theorist will notice that the employer-employee relationship is a political one: not just an isolated exercise of power to arrive at a deal in this one instance, but to enter into a continuing relationship where the employee is a functioning part of a social organization exercising political power in the economic system. I am not talking about influencing the legislature when I say, political; I am talking about the daily routine of operating a business using an extensive, hierarchically supervised team of strangers to accomplish tasks and administer technical control a production and distribution process — that’s politics in action in daily life. Treating capital as if it is a stock and can be usefully regarded as an accumulating stock in a broad range of circumstances is deceptive I think without making the bargaining explicit. The production function model is particularly faulty, because it assumes away the managerial and technological, even while pretending that capital qua stock can earn an income proportional to marginal contribution to output, as if it is being metered into the production process. As I said elsewhere, capital investment tends to consist at its core of sunk-cost investments. There’s no metering into output; no varying with quantity of ex post output. And, being a sunk-cost investment the historic cost of the capital itself cannot demand or bargain for an income. Its sunk, its done. If there’s a bargaining power, that bargaining power is attributable to the political rules of the game and the entrepreneur’s manipulation of them. Wealth earns an economic rent, and that rent is a political arrangement semi-detached from the particular characteristics of the sunk cost “stock” of capital. Contingency enters it, though, and the struckness of a sunk-cost investment may make it a cornerstone of persistent structure and risk-bearing. Stripping out the politics of uncertainty and risk robs capital of its functional essence. And then since it is a capitalist system we are talking about, these political arrangements can be bought and sold in financial markets. Regardless of the underlying political process which created these claims, holders of more wealth will have a higher capicity to purchase arrangements with higher risk and earn a higher rate of return over time. Then why the **** is CT devoting so much time to it? Riddle us that. Dare one ask what non-reactionary bk you think CT should be discussing instead? A H @ 68: holders of more wealth will have a higher capicity to purchase arrangements with higher risk and earn a higher rate of return over time. I am not sure how “higher risk” should enter the narrative, if we are striving to speak honestly and plainly. As you imply, it may not be a higher risk in a large enough portfolio. And, we ought to consider strategic span of control — if you buy up competitors and antagonists, you may have additional options to corrupt the institutional processes that force wealth to bear risk. I think Ze K is right: it is a reactionary book in that its acceptance of neoclassical economic terms of reference abstract so far from reality that people have to be reminded that the distribution of income is contested politically. But, it is a useful book in that the absurdities of its overarching framework combine with its nod to Marx to invite such reminders even while engaging the complacent and exposing the conventional wisdom to at least a cursory examination. This very mild form of slightly subversive controversy is CT’s specialty. I’m genuinely interested in a fleshing-out of this theory of rent as a result of sunk-cost investment. John Investor makes an investment in some real capital assets — a sunk cost investment. As a result of ex-ante shrewdness and ex-post luck, that investment earns rents higher than the rate of interest. The claim that seems to be made here is that those rents are fair game to be distributed by a political process, without much in the way of a negative consequence for growth in general. But what about the other two investments made by John Investor, the sunk-costs investments that actually lost money? How does this magical process work, where just by virtue of having liquid assets, you can be sure to make sunk-cost investments that on average earn rents? Indeed, if such a magical process existed, then we could easily solve all economic problems: just have some worker’s fund chase all those easily obtainable rents and distribute the proceeds to those workers. Again, I do want more detail on what Bruce Wilder means, as this seems to be central to a lot of claims that he makes in this forum. So far, it does not look like a defensible theory. Abstract terms of reference have their hazards, as you demonstrate. You have made an argument made familiar in the doctrine of contestible markets: that John Investor is a portfolio investor taking risks with his liquid capital, making multiple wagers, some of which pay off big and some of which may prove losers. From John Investor’s point of view what motivates his risk-taking is the ex ante expectation of return on all his bets taken together. Ex post, a high return on one particular lucky bet may look excessive, but the big win ought to be seen in the context of having made several bets, some of which proved to be losers. Assuming there was social value to the trial-and-error, it would be policy short-sightedness to begrudge John Investor a high return in one case when that big win merely offsets losses, resulting in a merely average return on the whole portfolio. That particular highly stylized case delineates one aspect of business investment, but is abstracting from many aspects of what is a dynamic process in which political power and negotiation plays a prominent part. I am saying a business, to survive, has to find a business model where it has the political power to earn a return on sunk cost investments. To understand the significance, you have to understand that merely making a useful investment does not guarantee the ability to charge enough to earn back the invested amounts. Consider an extreme example: investing in a railroad in the mid-19th century. Before a railroad business can operate, it must have rail laid along a route where it has a right-of-way, terminals, locomotives, rolling stock and trained personnel. Just building the rail along the route was an enormously costly venture, and it had to be completed before transportation services could be sold. Of course a completed railroad could move a lot of people or goods very quickly compared to the previous alternatives: horse-drawn wagons or canal boats, and in many cases at a much reduced cost. The implications for farmers, merchants and manufacturers along the route of reduced cost of transport were clear. So, imagine the railroad from London to Manchester or Philadelphia to Pittsburg has been built and gone into operation: what rates can that railroad charge? Will the railroad charge a flat rate of some sort — so much per pound or per volume measure? Will the railroad be able to earn a return on its investment and pay its fixed costs from what it earns from operations? Building the railroad has changed what it costs to travel from Manchester to London or to move merchandise from Philly to Pittsburgh. But the sunk cost investment in rail and route is no part of that new cost, because the sunk cost investments can not be withdrawn. When the merchant or traveller comes to the railroad to “negotiate” a rate or ticket price, only the variable costs of operating a train have to be covered to induce the railroad to want to accept an offer. But, if the railroad does not charge someone more, the railroad will never earn a return on investment. It becomes an intensely political issue. The railroad can make or break a merchant or farmer, by its rate setting. Rates determine the value of land along the route. For scheduled services in particular, railroads need to be able to price discriminate, but no one wants to be the one paying extra. Political power was necessary to get a right of way. Governments granted eminent domain. Political power was necessary set discriminatory rates. Land grants were used to aid financing of railroad construction. Workers on the railroad were among the most productive in the society. But, they needed effective unions to achieve pay commensurate with that productivity and government set rules for labor relations, as rail unions discovered their hold-up power. Established companies, which have at least partly solved the problem of earning an economic rent are in a privileged position in being able to be relatively certain in their prospects for being able to secure returns on later and further investments. The most powerful railroads could invest at low risk in reducing the cost of their own operations. I don’t understand how the r is determined in this formulation. I still suggest the best way to read the identity is r=α/β. This means that as beta tends to rise as a long term tendency due to a new higher s/g, capital can only maintain its rate of profit by tilting the distribution of income in its favor. r is now clearly not just a marginal product of capital. It depends on distributional struggle; this formulation puts distribution in the center. This makes the bargaining question even more important for the normal operation of capitalism than it is in Mason’s rewriting of the first law while still not making social dynamics only about bargaining. Who first wrote the identity as r=α/β? Again I think it is too subjectivist to make the value of the capital stock almost entirely dependent on fluctuations in extant capital values themselves dependent on bargaining power reflected in alpha. I like Mason’s old point that with technological progress the value of net additions to the capital stock tend to decline in value. If this is true the savings that need to be invested for net additions for the capital stock would tend to fall. And this creates problems for Piketty because s/g may adjust downward and beta may not rise and thus the capital share would not have to rise dangerously high to keep r constant. This line of criticism has always been the most important one against Marx as well.